07.07.2017 Rittal has been recognised by trade magazine “Elektronikpraxis” as a “Milestone in Electronics”. 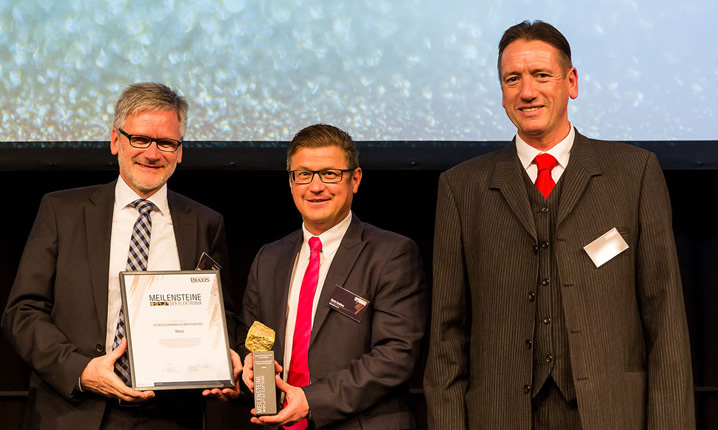 In the context of the magazine’s 50th anniversary, the world’s provider of industrial enclosures, power distribution, climate control and IT infrastructure won the award in the category of enclosures and climate control. The jury praised Rittal’s decisive influence on Germany as an industrial location and its groundbreaking technologies. 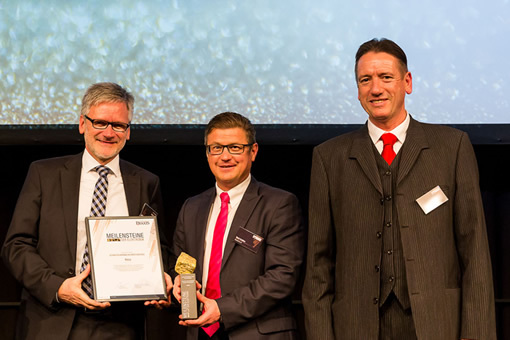 The abilities to look both back and into the future were the decisive characteristics that enabled Rittal to impress when the “milestones of electronics” awards were handed out. On the occasion of the fiftieth anniversary of the “Elektronikpraxis” trade publication, the journal paid tribute to some 20 leading companies in the electronics industry for their services and solutions that are defining Germany as an industrial location. Rittal, a family business with a long-standing tradition, which develops energy-efficient products and intelligent value chains for the future, made a great impression on the jury. “Technology is changing rapidly. And electronics is its turbo-drive for innovation,” said Johann Wiesböck, editor-in-chief and publisher, outlining the significance of the companies so honoured. Image: During the anniversary celebrations in Munich’s Wappenhalle (coat-of-arms hall), chief editor Wiesböck (right) handed over the “Milestone of Electronics” to Rittal, represented by Martin Kandziora (centre), Head of Market Communication, and Ralf Schneider (left), Rittal’s Head of Product Management and Business Development Climate Control.